All schools in Rajasthan have their own school building, providing children with a safe and comfortable learning environment for a quality education. In Rajasthan, only a few schools do not have their own school building. However, due to non-availability of land for construction of buildings, 28 schools in Rajasthan are run in rented or rent-free buildings such as community centers, temples, private buildings, etc. This is an unstable situation and makes it difficult for students, teachers, and principals to feel ownership over the school. By constructing a building that aligns with RTE Act norms for these 28 schools, there is significant potential to transform the learning experience of students and communities by creating ownership over the school. 28 schools in Rajasthan which lack a building will have an all-weather building available with all the requisite facilities. Current enrollment in these schools is 1014 students, all of whom will be able to study in proper school buildings once they are constructed. The 28 schools proposed to be built in this project are currently run in rented/rent-free buildings such as community centres, temples, private buildings, etc. There are chances of eviction by concerned owners. 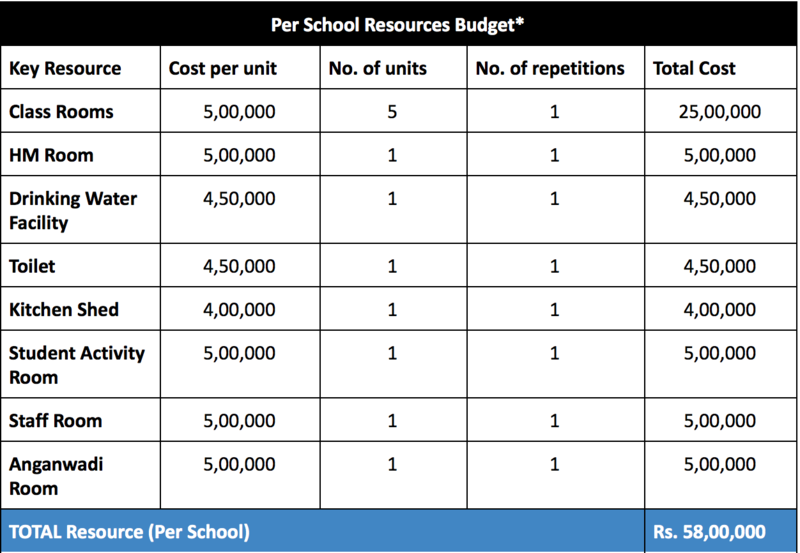 Because schools without their own buildings are run in private buildings, deficit facilities can not be provided at cost of government, even when funds are available in the budget. Work will be carried out through the School Management Committee (SMC) of each school, consisting of teachers, students, public representatives, parents, etc. They will ensure transparency, quality, and cost effectiveness in construction. In addition to this, a Junior Engineer (SSA) at Block Level, Assistant Engineer (SSA) at District Level and Superintending Engineer at State Level, have been entrusted with the responsibility of technical supervision and monitoring of civil engineering works targeted to be executed by SMCs. Providing a permanent building to a school transforms the learning experience for students. The introduction or improvement of a school building is known to increase student enrollment; hence it will help to educate more children in Rajasthan.